Yesterday was MLK Jr. Day and in his honor people and businesses posted motivation quotes by him to social media profiles. I saw some really good ones but the one that really struck a cord and made me stop to think was as follows “Darkness cannot drive out darkness; only light can do that. 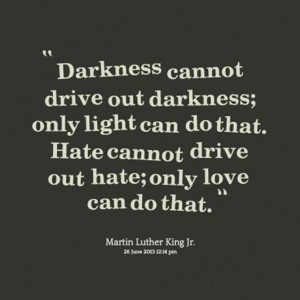 Hate cannot drive out hate; only love can do that.” -MLK Jr. It might only be me but when I read quotes like that one I think “it would be great for the masses to show unconditional love” or “world peace is possible”. In other words, I imagine the quote affecting large groups of people. Not until yesterday did I see that the light to remove darkness has to come from with me. The love to remove hate has to happen within me. For example; I cannot hate that someone is racist. It only fuels more negativity. Instead I have to shed light on the love people need to have for each other. Now, I say “me” but mean “us”. If each of us finds the light and love within ourselves it will soon become the masses. As MLK Jr. said; “confidence is taking the first step without seeing the whole staircase.” Without knowing how you will affect the community, find what fuels the light within you and share it. So my task for you today is to join me on this fist step towards a lighter more loving world. 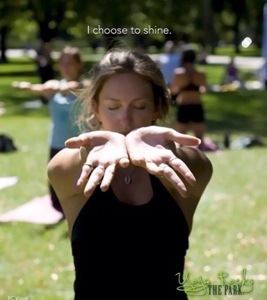 Whether it is your religion, practicing the true meaning of Namaste or simply organizing an aspect of your life, take a moment to discover what drives your light and love. By working on ourself, we will become a better group. A greater society.